Introduction The US Dollar has had a special status for centuries. When I (a Canadian) wanted to withdraw some cash from a bank machine in Lima, Peru the only currency available other than Peruvian was the US Dollar. It has been used as the standard currency of trade and has been the currency that traders always go for when there is an international crisis. But what if the crisis is the very value of the "almighty American dollar"? It will be interesting to see what happens in the near future. The world will soon face a terrible crisis and you might be wise to have your financial house in order and do some planning for financial hard times. Even more important is to get your spiritual house in order and be sure that your real treasure is in heaven. "An unstoppable sequence of events has been put into motion finally. The pressure has been building for months. Some themes are plainly evident, except to those who wear rose colored glasses. "The US Treasury Bond will be brought home to the US and British banks, where it will choke its bankers, then be devalued for survival reasons, after a painful isolation. "The Chinese and Russians will conspire to finance the Eurasian Trade Zone corridor foundation with USTBonds, held in reserve, put to usage. The British will play a very unusual role, selling out the United States in order to be squires to the Eastern Duo. The process has begun; it cannot be stopped. The events are already being grossly misinterpreted and minimized in the US press, where devoted lapdogs, artistic swindlers, and creative writers prevail. The following blueprint is the result of years of planning, with steady information and hints and confirmations by at least two Hat Trick Letter sources. The sunset of the US Dollar has a blueprint." 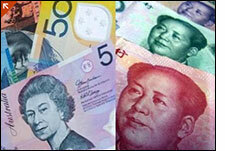 Australian dollar and Chinese yuan. "Australia is seeking to bypass trading in the US dollar with China in an effort to avoid the commercial uncertainties that come with the recent fluctuations in the greenback. For example, just a half a year ago, the US dollar traded at about $1.20 to the euro; by February, it had weakened to $1.34 per euro and now it is going for $1.27. "Eliminating the dollar in trade will be the focus of Australian Prime Minister Julia Gillard's trip to Beijing next week. Trade with China, Australia's primary trading partner, totaled $120 billion in the last fiscal year. China buys nearly one-third of Australian exports. "The Australian government has made no secret of its aims to shift away trade from the US dollar, the world's primary reserve currency used in international commerce. "Canberra's aims to build on a $30 billion currency-swap deal with China signed last year that makes funds available for business transactions between the two countries through their respective state-run banks." Jim Rogers: "I Suspect They'll Take The Pension Plans Next; I For One Am Worried, And I'm Taking Preparations"
to under the guaranteed amount. "Speaking towards the frightening implications of the Cyprus banking collapse, Jim said that, 'It's been condoned [now] by the IMF, the European union, and everybody else in sight; that a government in need, can take assets. We all knew they could tax us...but this is the first time that I'm aware of, that they've gone in and taken bank accounts. They took gold from people in the U.S. in the 1930's ... but I've never heard of them taking bank accounts. [Now] they're doing it. 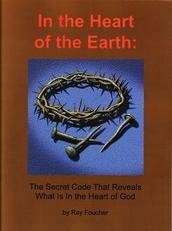 So be careful [because], now they can take your bank account under this precedent.'" creation of a "new world order." 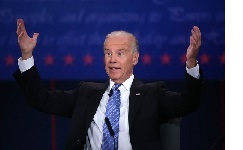 "Delivering the keynote address at the Export-Import Bank Conference in Washington, D.C. on Friday, Biden stated "the affirmative task we have now is to create a new world order." "He continued: 'Because the global order is changing again, and the institutions of the world worked so well in the post-World War II era for decades, they need to be strengthened, and some need to be changed.'" IRAN -- ratcheted up its vitriol against Israel and the United States over the weekend, warning that an attack on the Islamic regime's nuclear facilities could lead to global war. The rhetoric eerily matched that currently coming out of North Korea against its perceived enemies. "The commander of the Islamic regime's ground forces, Brig. Gen. Ahmad Reza Poordastan, in his speech at Friday Prayers, also warned 'the enemies' that the country's army has its finger on the trigger and that any attack on the country will make the 'enemy' regret its actions. The regime's PressTV ran an op-ed analysis on Saturday with a headline 'Iran deals deathblow to U.S. global hegemony.' The analysis, by Finian Cunningham, an Irishman whom the outlet calls 'a prominent expert in international affairs,' blames America for much of the world's problems and warns of its decline." This next article explains a little of the establishment of the US dollar as the world's reserve curency. "My next set of articles are not for the faint of heart. If you desire to keep on burying your head in the sand, then go watch the NFL Draft. "A novel system for monetary and exchange rates were established in 1944. The Bretton Woods Agreement was developed at the United Nations Monetary and Financial Conference held in Bretton Woods, New Hampshire, from July 1-22, 1944. This conference established the US dollar as the reserve currency of the world. "As a result of the Bretton Woods Conference, all nations desiring to purchase Middle East oil had to first purchase dollars and use these dollars to complete the purchase of oil. "Nearly everyone inside of our country benefited from this system. Americans basically enjoyed a stable currency minus the inflation rates of about 5% per year which served as an informal tax that went into the Federal Reserve banksters' pockets. Thus, the Petrodollar was born. If the Petrodollar were to ever be successfully undermined, our currency would sink faster than a submarine with screen doors because there is nothing backing up our money." "The former head of Israel's military intelligence said last week that Iran has already crossed the 'red line' Israel previously set as the point beyond which it would be nearly impossible to stop the Islamic Republic from attaining nuclear weapons. "What that means is that as soon as the Iranian leadership decides to build an atomic bomb, it will be able to do so in a mere month or two. Far too short a time for Israel or the international community to act. Bottom-trawling is causing irreversible damage to coral reefs. CNN -- As the human footprint has spread, the remaining wildernesses on our planet have retreated. However, dive just a few meters below the ocean surface and you will enter a world where humans very rarely venture. "In many ways, it is the forgotten world on Earth. A ridiculous thought when you consider that oceans make up 90% of the living volume of the planet and are home to more than one million species, ranging from the largest animal on the planet -- the blue whale -- to one of the weirdest -- the blobfish. "Remoteness, however, has not left the oceans and their inhabitants unaffected by humans, with overfishing, climate change and pollution destabilizing marine environments across the world. "Many marine scientists consider overfishing to be the greatest of these threats. The Census of Marine Life, a decade-long international survey of ocean life completed in 2010, estimated that 90% of the big fish had disappeared from the world's oceans, victims primarily of overfishing. "Tens of thousands of bluefin tuna were caught every year in the North Sea in the 1930s and 1940s. Today, they have disappeared across the seas of Northern Europe. Halibut has suffered a similar fate, largely vanishing from the North Atlantic in the 19th century. "In some cases, the collapse has spread to entire fisheries. "The situation is even worse in Southeast Asia. In Indonesia, people are now fishing for juvenile fish and protein that they can grind into fishmeal and use as feed for coastal prawn farms. 'It's heading towards an end game,' laments Roberts." The US Dollar will fall and its fall will just be a part of the hard times that come upon the whole world at the end of time. Keep an eye on it and on the Middle East situation and the other crises that are building - like a house of cards, it could all come down at once.